The HSPD-338 High Speed Pen Dispenser is manufactured by GGA Packaging. The HSPD-338 Pen Dispenser is designed to deliver pens and other non-uniform cylindrical products in groups to cartoning machines. It will accept pens with either uniform or random cap orientation with or without a clip. 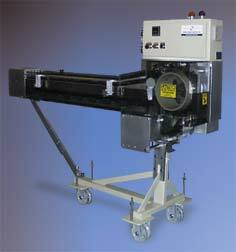 Speeds up to 380 parts per minute depending on item and application. All models are UL approved and have optional CE certification.